At CTFM, when we take you travelling, it’s usually to the far east and Japan with delicious tales of sushi. Today, however, we’re going to journey across the Pacific Ocean to somewhere completely different – a land of hula dancing, big wave surfing, flower necklaces, tiki torches and luaus. Yes, we’re going to Hawaii, home of the new dish that’s taking South Africa by storm – the poke bowl! Even if you haven’t been to a CTFM recently, and you don’t follow any foodie accounts on Instagram, there’s still a good chance you’ve seen a poke bowl. Like many of the food trends that seem to come out of nowhere and change our lives forever, the poke (pronounced (‘poh-KAY’) bowl is not actually new, it’s just from far away. ‘Poke’ is a native Hawaiian word meaning ‘to slice or cut’, but it can also simply mean a ‘chunk’ of meat and refers to the cubes of raw fish that serve as the centrepiece of any good poke bowl. Because Hawaii is a group of islands way out in the Pacific Ocean (and with Alaska, one of only two US states not connected to the mainland), fish has historically served as a key part of the diet of the people there. Some say the poke style of cuisine developed from fishermen adding seasoning to cuts from their catch to eat as a meal or snack, but if you ask a native Hawaiian, they’ll tell you it’s pretty much always been there. In Hawaii it’s like the national fast food – just much healthier. Whereas South Africans might get a burger and chips or a sandwich, Hawaiians will get a poke bowl. And while they’ve been eating it for years, it only crossed over to the US in a big way beginning in 2012. Since then it’s grown tremendously, becoming a worldwide culinary phenomenon. The appeal is clear: a poke bowl is both versatile and healthy – allowing chefs and restaurants to experiment and differentiate their poke bowls, while sticking to the raw fish and vegetable ingredients that honour the poke bowl tradition. It’s become so popular, in fact, that it’s been called ‘the new sushi’. What makes a poke bowl? At its essence, a poke bowl is a rice bowl topped with fresh marinated fish and a range of garnishes. Jasmine or sushi rice usually forms the base layer, with its heat offering a nice contrast to the sushi-grade fish, served raw and therefore cold. Then comes the main ingredient, usually yellowfin tuna, but also in many cases octopus, salmon, and even tofu. This is then seasoned, primarily with traditional Asian seasonings such as soy sauce, sesame oil and onions. 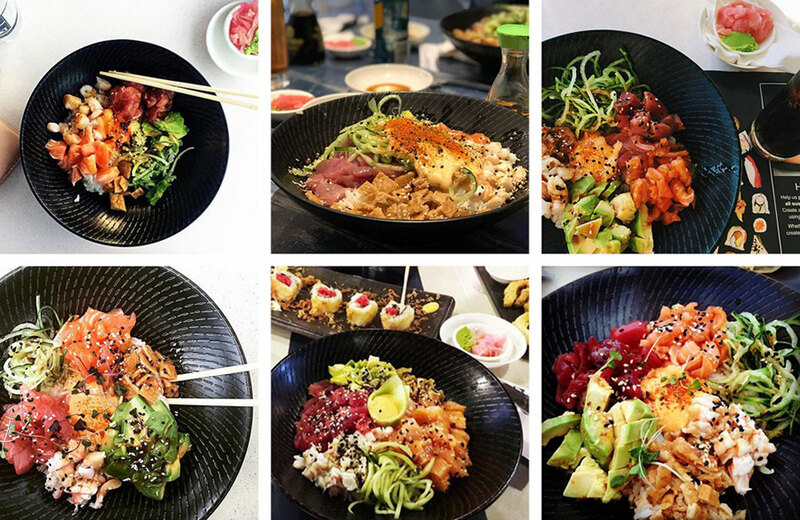 Lastly, spices in your poke bowl are whatever you want them to be – from chopped chilli peppers to seaweed to wasabi. It’s part of what makes poke bowls so delicious. Since the poke bowl’s arrival in the US, South Africa and beyond, avocado has also become a staple ingredient, adding a creamy texture to the dish, while taking the edge off the spices. And, unlike sushi, no chopsticks are required to enjoy your poke bowl the traditional way. A poke bowl combines the best of rice, salad, and sashimi in a dish that’s healthy, tasty and filling – so we thought we’d combine the traditional poke bowl with the best of our menu. CTFM’s special, local-style poke bowl is a seafood medley of texture and flavour that’s getting two thumbs up from our customers. In fact, it’s one of the best-selling dishes on our menu. 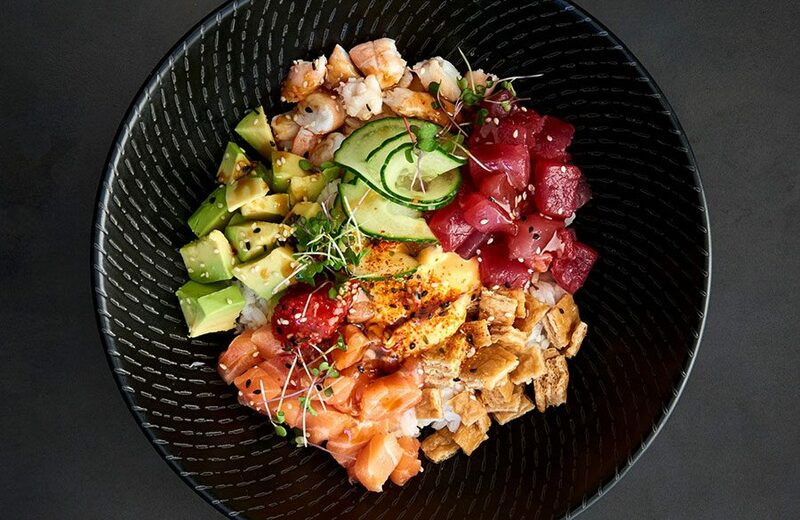 The CTFM poke bowl begins with the traditional base of rice, but instead of relying on just one type of fish, we’ve included tuna, salmon, prawn, avocado and bean curd to create a five-sided poke bowl for five different experiences in one dish – or one which you can mix and match to your heart’s delight. Sesame seeds and a soy dipping sauce act as traditional accompaniments to your poke bowl, but we’ve added our customer-favourite seven spice seasoning, as well as some spicy mayo, to top off what could just be your new favourite. …or make your own poke bowl at home! Step 2: Finely chop the onions, mince the garlic, and add them to a bowl along with 3 tablespoons of soy sauce and a dash of sesame oil – your new marinade mixture. Step 4: Serve over rice with chopped or cubed avo and any other garnishes you want. And voila! Your very own poke bowl. Try adding things like nuts, sesame seeds, chilli and wasabi to vary the texture and flavour, and if tuna isn’t readily available, you can always try salmon. So, what are you waiting for? Whether you love seafood or sushi or just trying something new, release your inner foodie on this great global trend that’s changing the way people around the world enjoy seafood!